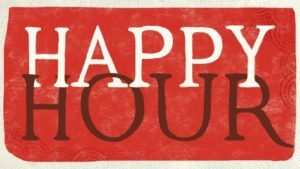 See Applebees Happy Hour times, specials and menus. What time is Applebee’s happy hour? What are the current Applebee’s specials? See the answers here. Applebee’s general happy hour times are listed below. Please note, that specials and times may vary at your local restaurant, but in general, these times and deals are correct nationwide. Happy Hour: 3:00 P.M. – 6:00 P.M & 9:00 P.M. – Close. Applebee’s Monday Special (Not available in all locations. Please call ahead): Burgers & Pitchers are $5 Mondays at Applebee’s, 4:00 P.M. – Close. Late Night Tuesday Special (Not available in all locations. Please call ahead): Patron for $5 only on Tuesdays, 10:00 P.M. – Close. Kids eat FREE (Not available in all locations. Please call ahead): Kids ages 12 and under eat free on Tuesdays when an adult purchases a full price entrée. Girls Night Out Wednesday Special (Not available in all locations. Please call ahead): $3 Trio Tastes, $3 Bahama Mama Perfect Long Island Iced Tea, $6 Perfect Sangria Margarita Pitcher starting from 5:00 P.M.
Thursday Late Night Deal (Not available in all locations. Please call ahead): $3 Absolute Vodka, 10 P.M. -Close. Friday Night Deals (Not available in all locations. Please call ahead): $3 Captain Morgan Spiced Rum, $3 Pinnacle Whipped Vodka from 10 P.M. – Close. Applebee’s Saturday Cinnamon Special (Not available in all locations. Please call ahead): Fireball, Pinnacle Cinnabon, RumChata or Cuervo Cinge just for $3 from 10:00 P.M. until closing time. The popular 2 for $20 deal gets you 1 appetizer or 2 sides + 2 entries. The 2 for $25 deals gets you 1 appetizer or 2 sides + 2 entries. allfoodmenuprices.com is not associated with Applebee’s in any way. See all deals and coupons at out page: Applebees Coupons. See the full menu and 2 for $20 menu at: Applebee’s Menu.